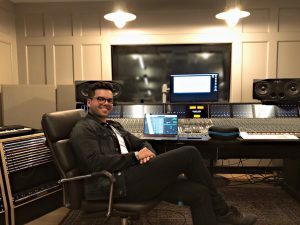 German Composer, Songwriter and Producer Sani Baladi started his musical career at the age of 6 by singing in a church choir and playing the piano. At the age of 14 he performed his first show singing “Hey Jude” by The Beatles and accompanying himself on the piano in front of hundreds of people. He writes his own music and has had many gigs in his hometown Hamburg. In 2013 he released his first official Song “Come With Me”, which he wrote, produced and performed. After listening to Hans Zimmer’s Score for Christopher Nolan’s “Inception”, he discovered Film Music and fell in love with every aspect of it. He then started to compose Music for Visual Media. At the age of 19 he packed his bags and moved to Los Angeles on his own to pursue his career and study music at Santa Monica College. He then moved to London to learn more about his passion and after spending time in London exploring the world of music he moved back to Los Angeles to compose Music for Film and TV and to study at Musicians Institute in Hollywood. He combines classical Music with modern and electronic sounds.